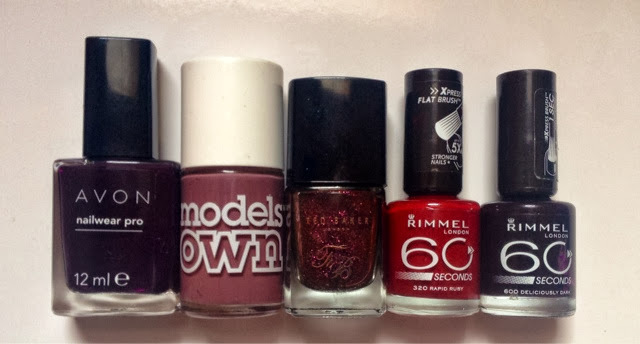 As the days are getting shorter and we're moving further away from summer I thought I'd dig out some of my favourite Autumnal nail polishes that will be seeing my through the colder months. I really love dark berry and taupey nails to really finish off a winter outfit, I think they're the perfect accessory to any knit or scarf. For a dark vampy look I then to go for deep purples that look like black with a little something extra I think these kind of polishes are much more interesting than a full on black look. This purple taupe colour from Models Own is one of my favourite dark neutrals that I own and is perfect for Autumn. As we're approaching the season of glitter I thought I'd throw in one of my favourite subtle dark glitters from Ted Baker as this polish is great if you want a hint of sparkle without too much going on. 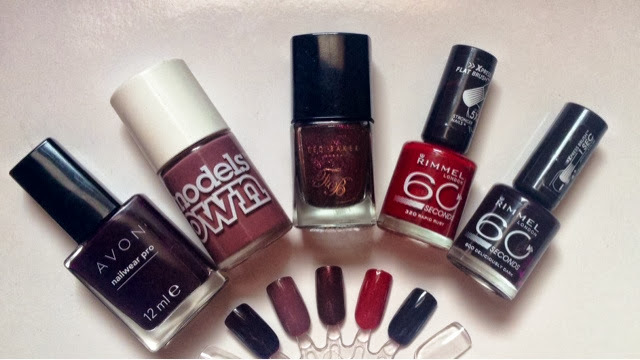 I've been digging out all my autumn nail polish shades too, I love the colours you've chosen!